Architect Frank Gehry On Why L.A. "Doesn't Take Architecture Seriously"
If you were to ask for the name of the one building that has made Los Angeles proud and given us architectural bragging rights, you would get the same answer from almost everyone: Walt Disney Concert Hall. Admittedly there are some rare gems tucked among this sprawl of undistinguished houses, cookie-cutter McMansions, and stolid public structures, but what sets our collective hearts singing is Frank Gehry’s swooping, shimmering wonder on downtown’s Grand Avenue. So why, I ask him, given that reception, haven’t there been more such offerings? Is it me, or has the landscape gone bland again? The 84-year-old Gehry is showing me around his huge studio in Playa Vista. It is cavernous but inviting, reminiscent of an airport hangar. Groups of young architects are quietly talking or staring at computers or bending over models, repositioning with dexterous care tiny chairs or miniature human figures. 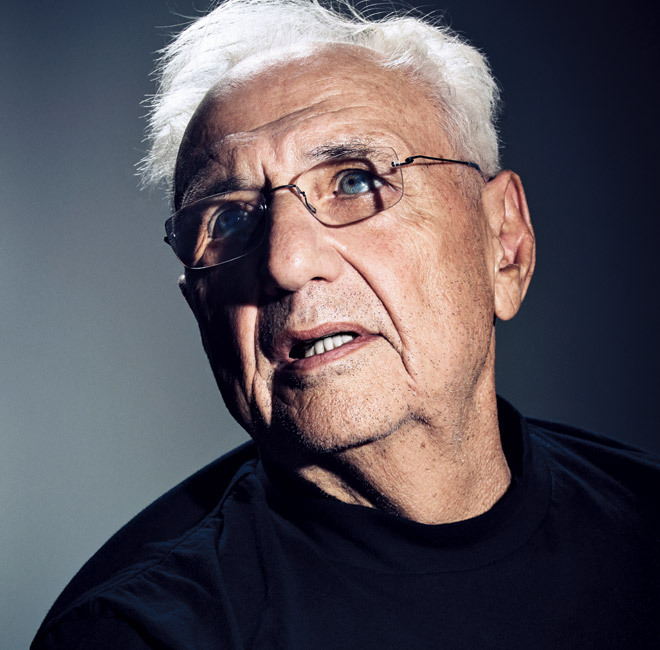 Gehry calls himself a reluctant tour guide—he has, I note, the strong yet self-deprecating ego of a true master—but he evinces a deep if low-key enthusiasm for all the projects he is pointing to: the vast Facebook headquarters in Menlo Park and the Guggenheim museum in Abu Dhabi, both under way, as well as the now-stalled Eisenhower Memorial that’s destined for the National Mall in Washington, D.C. There is also a ravishingly lovely sailboat he is designing for a real estate magnate and a small concert hall in Berlin. He bends to scrutinize a model of the latter, indicating the elevations and angles. Gehry lights up when talking about classical music, for which, he says, he has only the talent of a devoted listener. “What about Disney Hall?” I ask. “That’s just one building,” he says with amusement. Gehry does not want to contribute to that derisive stance even as he quibbles with our vision. He was born in Canada but moved to L.A. in his late teens. He is a product of our freewheeling environment and has an affection for it. Despite the artistic excitement of the ’60s, architecture began playing it safe, Gehry says, leading to a number of unexciting public buildings. LACMA, he notes, is a prime example. Designed in that decade by William Pereira after the mayor opposed the more creative Mies van der Rohe, it was in effect a riff on Lincoln Center, as was the Music Center being constructed across town. That became the model for cultural sites here, Gehry says. We weren’t confident enough as a city to go for our own style. We imported it from the east, nice, sturdy, safe structures that didn’t challenge the eyes or the head or the heart and didn’t reflect the diversity and tumult of our unique turf. The 1980s update to the museum by the firm of Hardy Holzman Pfeiffer was, most Angelenos would agree, equally tepid and unaffecting. The structure doesn’t stir anything inside; it is neither imaginative nor inviting. Now we have a prospective upgrade by Swiss architect Peter Zumthor. It is clearly intended to be more daring though, on first look, it’s also determinedly weird, an outsider’s effort to capture or appeal to this quirky metropolis. We have to wait and see, Gehry says. What we’re looking at now is preliminary. None of us knows what the final design will be or whether the museum will ultimately find the funds for it. He obviously wants the best for his profession and for what it can contribute. On this score, Gehry says, Los Angeles has let itself down. He also believes that we keep making mistakes by trying to conform to old ideas of what a city should be. Case in point: the ongoing drive to give us a bona fide downtown. He finds these efforts—and he himself has been involved in them, specifically the Grand Avenue Project—both anachronistic and premature. At the same time Gehry says that the city is too big and varied to want or need a single center—a 19th-century notion unsuited to the reality of Los Angeles. For him the heart of L.A. is Wilshire Boulevard. What about his own missed opportunities in this city? Is he disappointed that there are not more signature Gehry structures?